The second Space Based Infrared System Geosynchronous satellite, or SBIRS GEO 2 for short, will be hauled into orbit atop an Atlas 5 from Cape Canaveral Air Force Station on March 19. It has been a hectic start to the year for United Launch Alliance and its Atlas 5 fleet, completing the quickest-ever pre-flight campaign in January at just 27 days from the start of stacking until liftoff of NASA's Tracking and Data Relay Satellite K on Jan. 30. That was followed a mere 12 days later by NASA's first Atlas 5 mission from Vandenberg Air Force Base in California that put the Landsat Data Continuity Mission spacecraft into orbit to extend the four-decade legacy of environmental monitoring by the satellite series. "I don't think everyone realizes what all is involved in launching two Atlas 5s, one of the East Coast, one off the West Coast, 11.5 days apart," said NASA launch director Tim Dunn. "Tremendous teamwork between the NASA (Launch Services Program) team, the spacecraft teams and especially United Launch Alliance. To review all of the data, to disposition all of the data observations, just exceptional work." Next up, SBIRS GEO 2 will join the Air Force's constellation of missile launch detection observatories flying 22,300 miles above Earth that provide a constant vigil to warn of incoming threats. 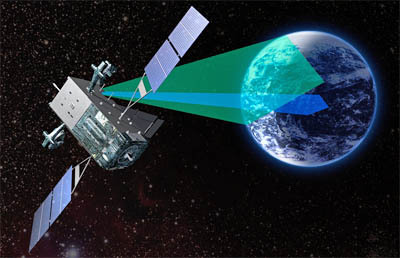 Built by Lockheed Martin, SBIRS is the next-generation system replacing the Defense Support Program satellites and their scanning infrared telescopes. The new birds offer increased sensitivity and the ability to stare at a specific spot on the globe. The first SBIRS GEO was deployed in May 2011. The Atlas 5 first stage and Centaur upper stage were delivered from the Decatur manufacturing plant to the Cape for the SBIRS launch, which will be the 37th flight of the vehicle and the 12th for the Defense Department. The bronze first stage with its RD-180 main engine was brought to the Vertical Integration Facility last Thursday for hoisting aboard the mobile launch platform. After installing the interstage adapter atop the stage, the Centaur with its RL10 engine was lifted into position Monday for the basic buildup of the rocket. It is the 401-version of the Atlas 5, which uses no strap-on solid rocket boosters. A four-meter-diameter payload fairing will shroud the satellite for launch. The spacecraft was shipped to the Florida spaceport aboard a C-5 aircraft from Lockheed Martin's Sunnyvale, Calif., factory on Jan. 11. It has been undergoing final testing in preparation for fueling and encapsulation in the rocket's nose cone. The craft will be delivered to the VIF for mating atop the Centaur in early March. "We performed a disciplined integration and test campaign for GEO-2 and are now looking forward to successfully launching this spacecraft to ultimately help protect our nation and allies with unprecedented global, persistent infrared surveillance capabilities," Jeff Smith, vice president of Lockheed Martin's Overhead Persistent Infrared (OPIR) mission area, said at the time of shipment. "As we continue to produce SBIRS assets, we expect to drive even greater efficiency into our operations to reduce costs for the government while still ensuring mission success." 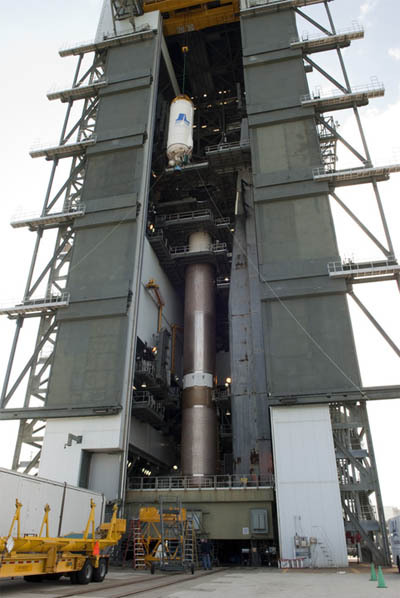 ULA hopes to conduct 8 Atlas 5 launches this year, including three more for the Air Force, a classified NRO mission and sending NASA's MAVEN atmospheric spacecraft to orbit Mars.